March 13 was declared Africa Scout Day by the Council of Ministers of the Organization of African Unity (now the Africa Union) in 1995. The main goal of Africa Scout Day is to take stock of the achievements of Scouting and building partnerships for more social impact in Africa. Please send us your achievements that fit that objective. Let’s publish what we have done here in South Africa! Nothing to report yet, perhaps this is the year to achieve something to announce next year, or sooner! 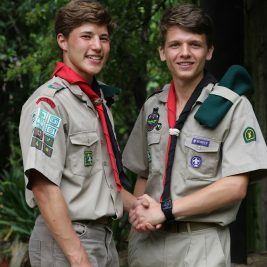 The Scout Association of Zimbabwe hosted this year’s celebrations from 7 to 11 March in Harare under the theme “Uniting young people through Scouting”. We thank them and congratulate them on a fantastic event.